The sign says it all. 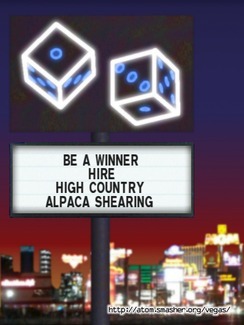 Shearing day does not have to be a roll of the dice. Cody & Faith giving The Taxman his first haircut. Cody shears on the mats and handles the animals gently. Nice smooth strokes removes the fiber uniformly. High Country Alpaca Shearing is now booking for the 2016 season. Arizona, California, Colorado, Idaho, New Mexico, Nevada, Oregon, Utah and Washington. Our shearing teams are practitioners of bio-secure shearing, have a genuine love for each and every animal and puts their health and welfare first and foremost during the shearing process. 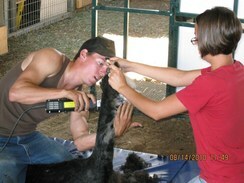 Our teams also service clients providing herd health to include teeth, toenails, shots and cria tipping. 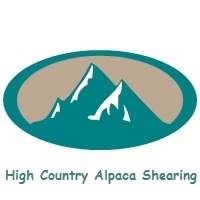 Shearing crias early enhances future fiber growth. Our shearers use the ropes and mats system for shearing. The animals are gently laid down on the mat and restrained using ropes tethered to 2 stationary points in the shearing station. We feel this is safer for the animals, shearer and helpers. 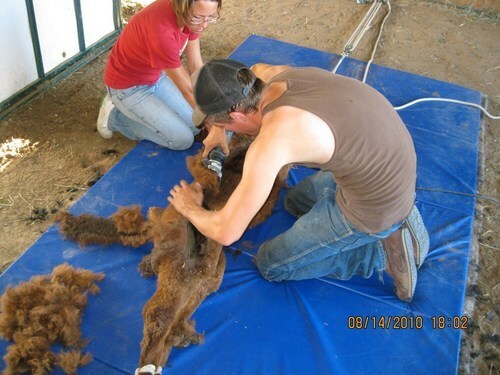 The head holder is trained to restrain and roll the animal during the shearing process. The action between these 2 professionals is called "the dance". 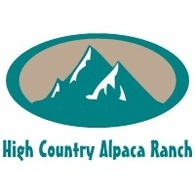 High Country Alpaca Shearing will be adding 2 - 3 shearing teams next year to better serve the 9 western states. They will be committed to getting the job done in a safe and steady manner and use their unique senses of humor to make shearing day fun. or Fill out our Form and we will contact you.